Since 1981 and across three committed generations, Giudice and Barndon has arranged sincere, professional and caring funerals for bereaved families. With deep roots in the local community, Giudice and Barndon offer a history of personal service and a commitment to upholding professional standards. Giudice and Barndon consistently provides outstanding yet unobtrusive care, with the utmost sincerity and respect for your family in your time of need. Pietro Georgio Giudice (George Giudice) was the founder of Giudice and Barndon Funeral Directors and Monumental Masons. Mr Giudice was working for a Funeral Director in Geraldton, then went on to become a builder in his own business “George Giudice & Co”. 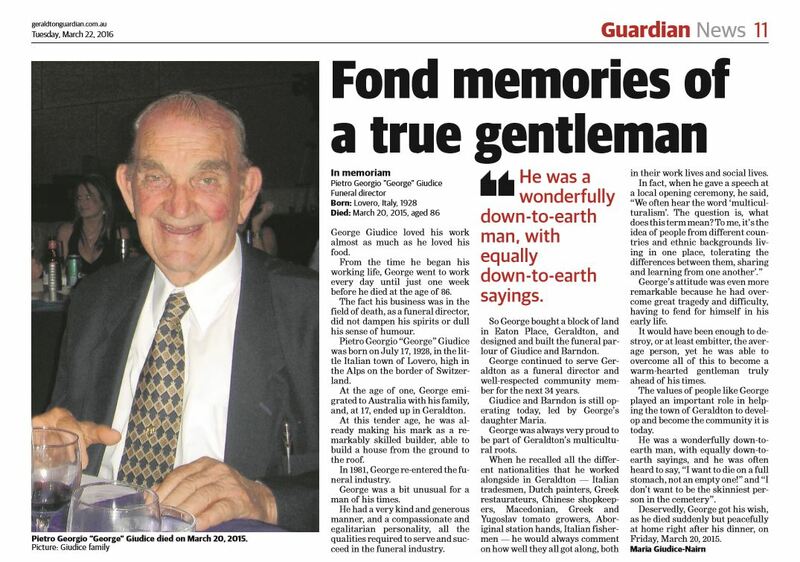 Mr Giudice then returned to the Funeral Directing industry in 1981 where he established the business “Giudice and Barndon Funeral Directors.” Mr Giudice worked here from 1981 until the day he passed away in 2015. George was a dedicated worker and his hard work is now continued through his Daughter Maria, Son in Law Kim, Grandson Shane and Granddaughter Jessica. Maria Giudice-Nairn, owner of Giudice and Barndon Funeral Directors and Monumental Masons has been working here since it was established. She previously worked for her Father (George Giudice) in his Building Business then carried through to Funeral Directing. Maria and her Father were extremely close which made their partnership in business very effective. She continues on Mr Giudice’s legacy today by helping families in a difficult time of need by guiding them through arranging a Funeral and then also Directing it on the day. Kim Giudice-Nairn also owner of Giudice and Barndon Funeral Directors and Monumental Masons with Wife Maria Giudice-Nairn has also been working here since the establishment in 1981. Kim worked for Mr Giudice as a registered builder in his Building and Funeral Directing and Monumental Masonry Businesses. Kim’s main role is to help families who would like to place a monument or plaque on for their loved one. Shane Giudice-Nairn, Grandson of Mr Giudice, Son of Kim and Maria Giudice-Nairn first started working when he was just 16 years old. Shane left school in Year 11 (2005) to help his Father in the business as this was his main desire. Shane now also helps families who wish to place a monument or plaque on their loved one, following in his Fathers and Grandfathers footsteps. Jessica Giudice-Nairn, Granddaughter of Mr Giudice and Daughter of Kim and Maria Giudice-Nairn. Jessica finished Year 12 in 2017, she was Head Girl at Geraldton Grammar School where she was educated for 14 years. Jessica then came straight to the family business. She mainly helps her Mother on the Funeral side of the business to help grieving families and friends to have closure through a Funeral. 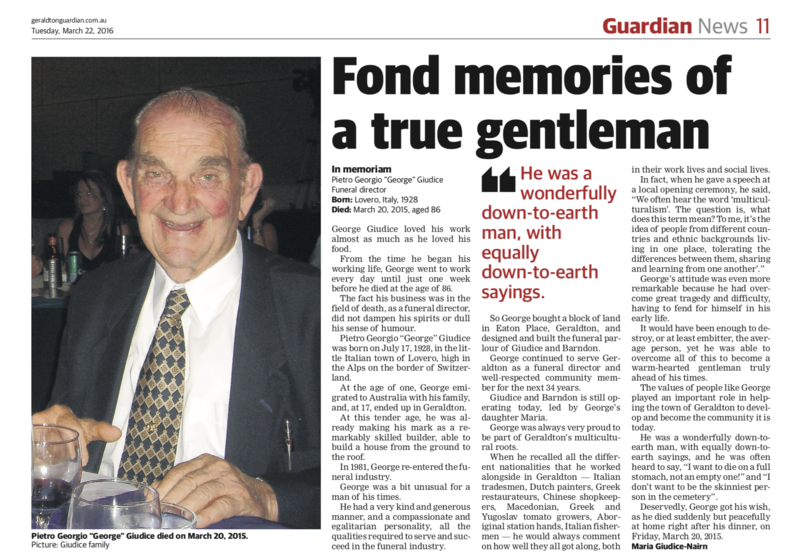 Giudice & Barndon Funeral Directors have a close relationship with Bowra & O’Dea Funeral Driectors situated in Perth. 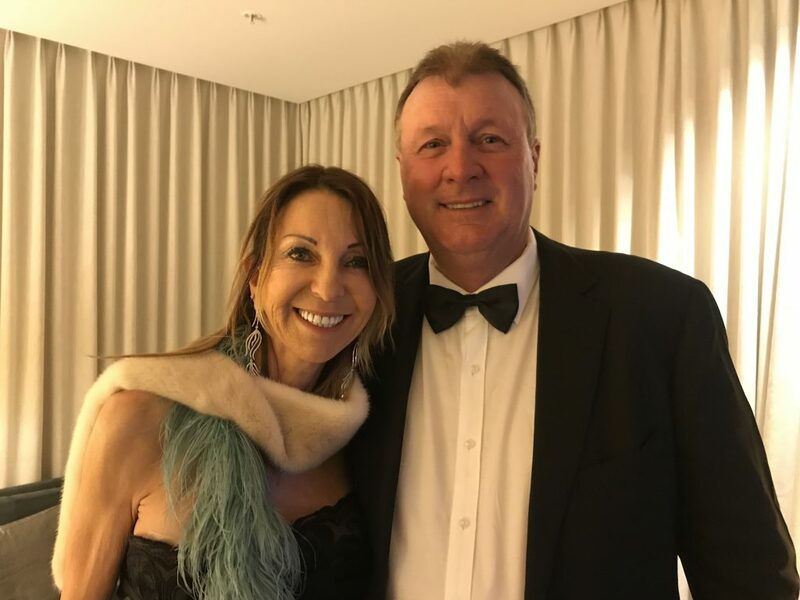 Maria and Kim Giudice-Nairn (Owners of Giudice & Barndon) recently attended Bowra & O’Deas 130 year anniversary Gala Ball. 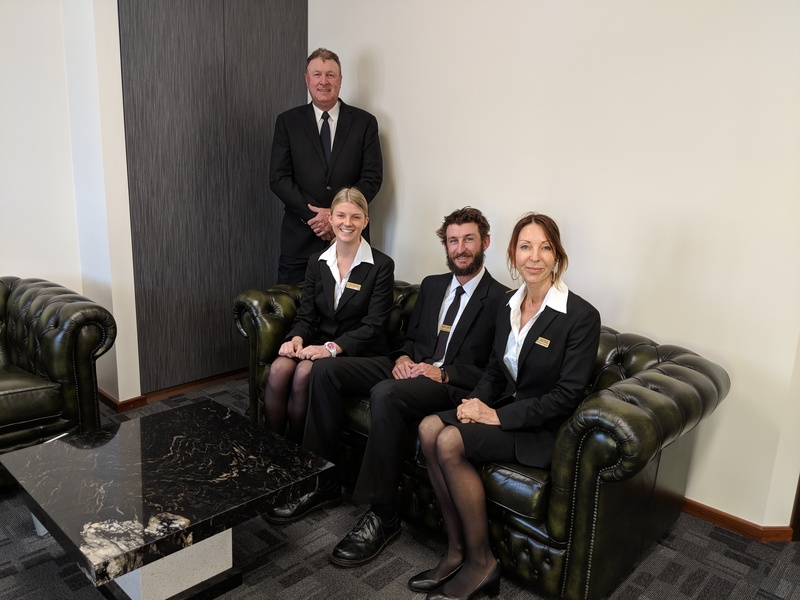 Giudice & Barndon Funeral Directors were the only Funeral Directors invited from Geraldton and one of three Funeral Directors invited outside of the Bowra & O’Dea business. The night saw 250 people attend- most working for Bowra & O’Dea themselves. Maria and Kim were honored to represent Giudice & Barndon Funeral Directors and were flattered they were invited. They both said they had a fantastic night and developed their relations with Bowra & O’Dea Funeral Directors and would like to thank them for their invitation.